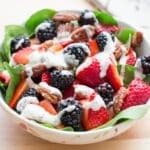 Fresh sweet berries, crisp greens, crunchy pecans and a drizzle of creamy poppyseed dressing all add up to one of our favorite summer berry salads. 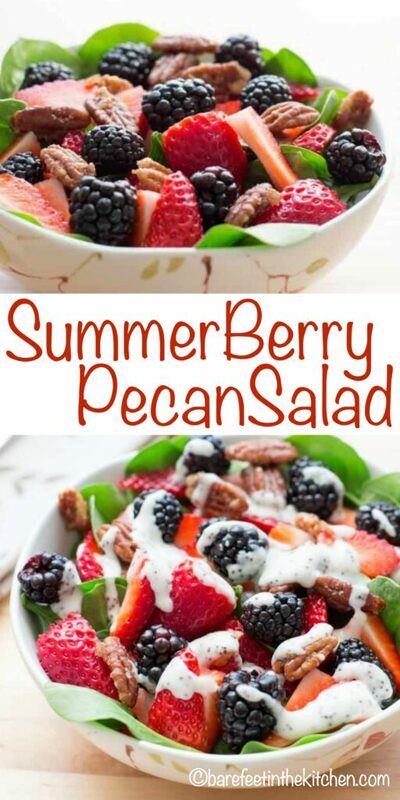 While my boys haven’t always been the biggest salad fans, when this Berry Salad with Pecans and Poppyseed Dressing is on the table they are very happy to eat their salads. If you’ve been here for long, you likely have caught on that I adore fresh berries. I put them in desserts, breakfasts, lunches, in salads, and even in my salad dressings. And naturally, I eat them by the handful more than anything else. I love berries! I’ve been making the most of the last of the summer’s berries with this amazing berry salad. This salad is my lunch as often as possible, all through the spring and summer. I’m pretty happy that there are still so many fresh berries available. You can add some chicken to this salad for a heartier meal or serve it as a side dish for a casual dinner or barbecue. To make this for a crowd, I like to layer everything on a giant platter, just because it’s so pretty that way. Serve the dressing on the side or toss right before serving. Here are a few more of our favorite salads to try. This Bacon Ranch Pasta Salad is a kid and adult favorite year round. Salad Snack On A Stick skewers are about as fun as a salad gets. Serve them ready to eat or set them out salad bar style and let people assemble their own. Cilantro Lime Cucumber Salad by The Food Charlatan and the Grilled Corn and Avocado Pasta Salad by Iowa Girl Eats both look delicious and they’re on my list to try soon. As written, this recipe will yield 1 1/2 cups of sugared pecans. They will keep nicely in an airtight container for several weeks. 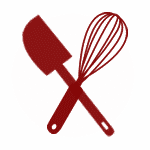 MAKE THE PECANS: Melt the butter in a large skillet over medium-high heat. Add the pecans and stir to coat well. Saute the pecans until they are fragrant, about 1-2 minutes. Sprinkle with sugar and continue stirring as the sugar melts and coats the nuts, about 5 minutes. After the sugar has caramelized and the nuts have turned a slightly deeper brown, remove from the heat and immediately spread the pecans on a piece of parchment paper. Let the pecans cool and then store in an airtight container until ready to use. 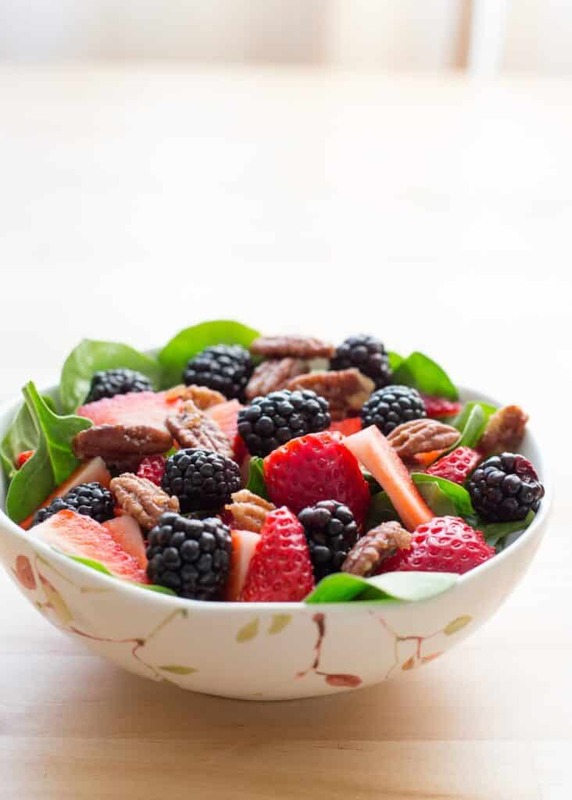 MAKE THE SALAD: Layer spinach and berries into a bowl and sprinkle with pecans. Drizzle with poppy seed dressing and toss to coat. Serve immediately. Enjoy! 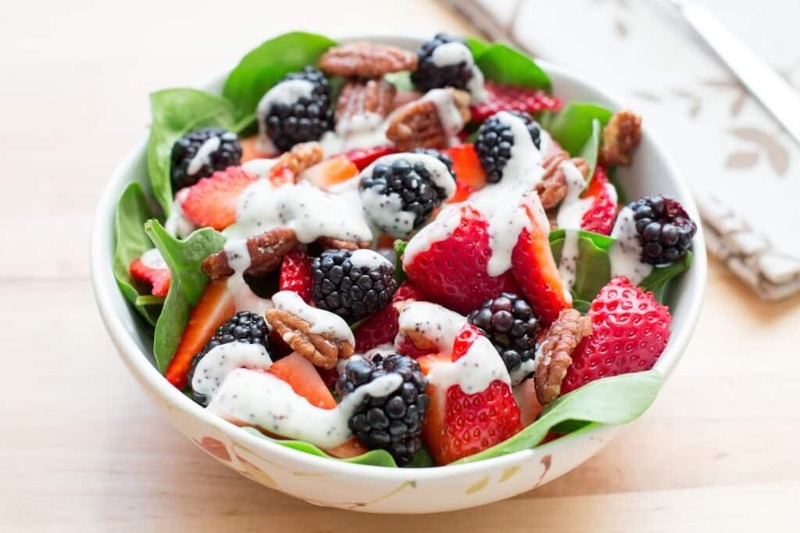 Fresh sweet berries, crisp greens, crunchy pecans and a drizzle of creamy poppyseed dressing all add up to one of our favorite salads. Layer spinach and berries into bowl and sprinkle with pecans. Drizzle with poppyseed dressing and toss to coat. Serve immediately. Enjoy! Melt the butter in a large skillet over medium-high heat. Add the pecans and stir to coat well. Saute the pecans until they are fragrant, about 1-2 minutes. Sprinkle with sugar and continue stirring as the sugar melts and coats the nuts, about 5 minutes. After the sugar has caramelized and the nuts have turned a slightly deeper brown, remove from the heat and immediately spread the pecans on a piece of parchment paper. Let them cool and then store in an airtight container until ready to use. Enjoy! This recipe will yield 1 1/2 cups of sugared pecans. They will keep nicely in an airtight container for several weeks. Looks like summer in a bowl!! I love it!! Berries and spinach, spring is almost here. Love this salad so much! I've made it several times.